If the flavours of the Middle East could be captured in a cookie, this would be THE cookie to get the job done. These flourless cookies speak to all of the senses, from the wonderful flavour, to the exotic aroma, the rich chewy texture and the visual appeal. One of my favourite cookies growing up was the Ghraybe. It’s essentially a Lebanese butter cookie that’s made of flour, sugar and butter and sometimes aromatized with mazaher (orange blossom water), then topped with a blanched nut and baked to a melt in your mouth perfection. The problem is that it is far from being anything in the realm of healthy. Inspired by the flavours of the Ghraybe, I’ve created this Orange Blossom Tahini Cookie. Not only is it vegan, it’s also made of whole food ingredients, meaning no refined flour or sugar. While it’s certainly not a Ghraybe, from a purist perspective, the flavour is every bit as rich and “buttery” and the aroma every bit exotic thanks to the mazaher. Tahini is simply pure ground sesame seeds, famous for its role as the loyal sidekick to the beloved hummus. You can find it hulled, unhulled, roasted or raw. I personally prefer the unhulled roasted variety, from a nutrition standpoint, although most traditional Middle Eastern recipes call for the raw hulled variety, so you’ll want to keep it on hand for things like hummus. Sesame seeds are rich in protein and a good source of thiamin, riboflavin, niacin and folate, which are essential B vitamins. They are also an excellent source of essential minerals like calcium, phosphorous, copper, manganese and iron. Tahini lends a special flavour and texture to this cookie, that is complemented but the mazaher, or orange blossom water, which comes from the distillation of fresh bitter orange blossoms to draw out their essential oils. Mazaher is aromatic and has a clean, delicate, fruity, and very distinct flavour that pairs beautifully with pistachios. A small amount goes a long way here. The result is quite rich and addictive so I only make a small batch at a time and ration them to last a bit so that I’m not tempted to eat so many in one sitting. They may be made with whole food ingredients but that doesn’t make it ok to scoff a dozen of them with your tea while testing variants of the recipe (that may or may not have happened and I may or may not have skipped dinner that evening in favour of a cleansing miso soup). Everything in moderation folks. 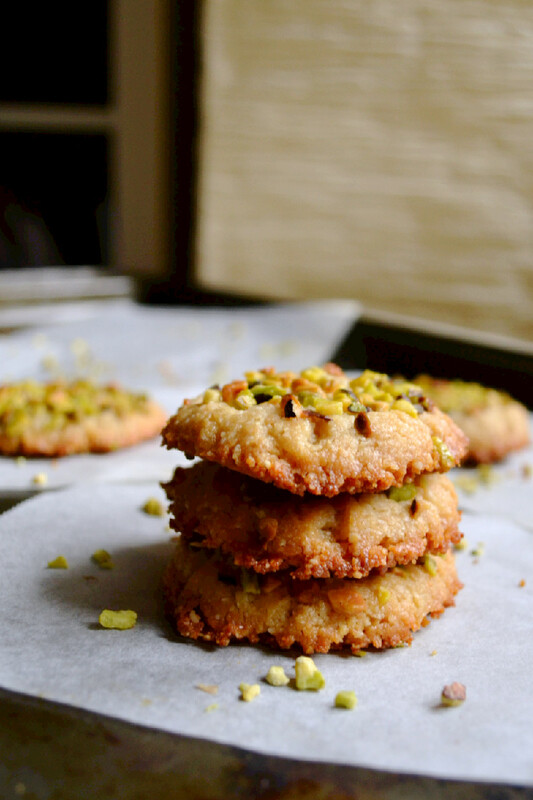 These flourless cookies embody some of the best flavours of the Middle East and are made with whole food unrefined ingredients such as ground almonds, tahini, orange blossom water and pistachios for a cookie that you can feel good about indulging in. Add almonds to a food processor and grind until you have a meal/flour. Transfer almond flour to a bowl and add coconut oil, liquid sweetener, tahini and orange blossom water and mix until it all comes together to form a pasty dough. Stir in chocolate chunks/chips if using. Form 9 cookies using a tablespoon measure and place them on a parchment paper lined baking sheet, making sure to leave space between them so they can spread. Gently flatten the cookies. 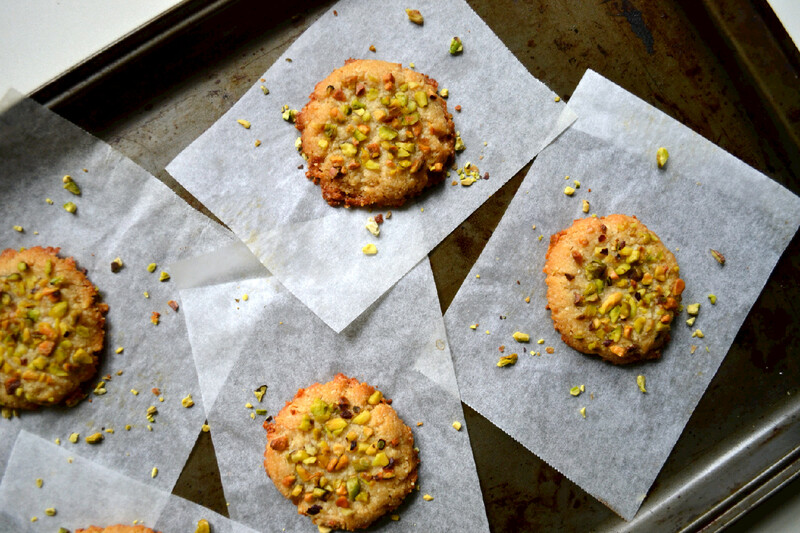 Add crushed pistachios to the top of each cookie if using, and bake for about 8-10 minutes, or until the edges turn golden. Be careful not to over bake them as almond meal/flour tends to burn quickly. Remove from oven and let cool completely. Do not attempt to take them off the tray while they’re still hot as they will fall apart. Once cooled, serve with tea or coffee, or chomp on them alone. Very beautiful cookies! I’m always looking for healthful snacks and this is a good one. Love this idea too, Nissrine. I’m working on a similar recipe right now as well, though I will definitely make room to try these out too — they look amazing and I am completely obsessed with all these flavors. The flavours work so well together here. They’re a bit delicate to work with, but the end result is so tasty.